For the past few months I’d been so busy that baking challenges from the We Knead to Bake group took a back seat.I was busy preparing for my daughter’s wedding. The wedding went well and now I’m back to my routine. I’ve got quite a bit of catching up to do… Aug, Sept, Oct, Nov and Dec. Oh dear! I managed to bake the challenge set for the month of January by a co- member of the group Amruta Kapileshwar Gaikwad. She asked us to bake Cilantro Scallion Rolls. Initially I did frown at the combination of tahini, honey, scallion and cilantro. While cilantro and scallion were not too much of a problem, I was wondering how a combination of honey and tahini would taste. Anyway, plunged into the deep end and decided to bake the rolls as given. Thank you Amruta for the challenge, loved the taste of the rolls. I must say the rolls tasted so delicious with a bit of the honey. I added chilli flakes. Don’t know why but ever since I’ve come back from India, I crave for chilli food. When my daughter and I ordered food when we reached India in Sept, I found it so chilli and my daughter assured me that it was normal. After few weeks I still found the food spicy and chilli but got use to it. Having said that, still cannot handle too much of chillis. Well, coming back to the recipe, I served the rolls with some soup and the remaining we had with some tea the next day. Of course blind me, sprinkled nigella seeds on top instead of black sesame seeds. When the rolls were baking hubby dear kept on complaining that he was getting an ‘onionish’ smell. I just told him that there was something wrong with his nose. Surely scallions don’t have such a strong smell I thought. While taking the photos still didn’t realize that I’ve used nigella seeds. I took the fist bite and said that doesn’t taste like sesame seeds. Got up from my seat to check the jar and there was a tiny piece of paper in it with nigella written on it!! 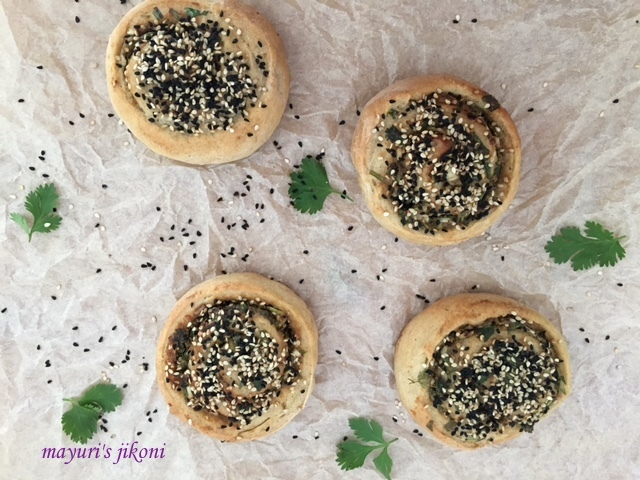 Nigella seeds or sesame seeds the rolls tasted really yummy. So go on try out the recipe and who says you can’t use nigella seeds instead of black sesame seeds? Mix flour, salt, sugar, yeast in a big bowl. Add mashed potato or whatever you’re using and oil. Rub it into the flour. Lightly dust the worktop with some flour and knead the dough for 10-15 minutes till its smooth and silky. Shape the dough into a round ball and lightly brush oil all over it. Place the dough in the bowl. Cover it with a tea towel or cling film. Let the dough rise in a warm place for 1¼ -1½ hours or till its double the size. Mix tahini, honey, sesame seeds and chilli flakes together till there are no lumps. Add chopped scallion and cilantro and mix it well. Dust the work top lightly with some flour. Gently knead the dough and roll it out into a rectangle of 10″ X 16″. Spread the filling over the rectangle, leaving ½” on each side. Roll up the rectangle into a swiss roll. Pinch the seams together. Using a sharp knife or dental floss, slice the roll into 12 equal parts. Line a baking tray with parchment paper. Lightly grease it with some oil. Put the rolls on the prepared tray with cut side up and leave about an inch of gap between the rolls. Let the rolls rise for 20-30 minutes. Brush the top of the rolls with water. Sprinkle sesame seeds over the rolls. Bake for 20-25 minutes or until the rolls are golden brown. Remove the rolls from the oven and let them cool on a wire rack before serving. Roll the rectangle with the filling tightly so that the rolls do not open up on rising. Make sure the tahini is thick and not runny otherwise it will come out of the rolls. Using chilli flakes is totally optional. Nice.. I still have to bake mine. Its delicious and different Shobha, do bake them when time permits.